Daniel Radcliffe is back as Harry Potter, and fans were definitely ready for the boy wizard's return. "Harry Potter and the Order of the Phoenix" took in a record $45 million on the day it was released in the United States. The movie's young star stopped by The Early Show to chat with Harry Smith. Radcliffe said that this the fifth chapter of the Potter saga is the first one that he didn't really mind seeing himself in. "I think in this film everybody's taken a big leap forward in terms their acting, and thankfully I can include myself in that," he said. "So I think for that reason, I think I'm just — I'm a bit better in this one. And, so I can enjoy watching myself more than I could before. Because even though I knew what I wanted to do before, I could never quite get there, whereas in this one, David Yates, our director, helped me to." 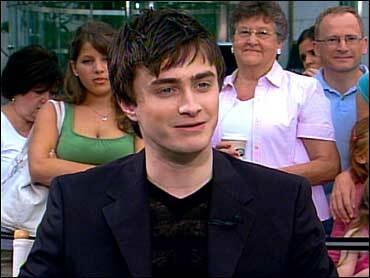 Radcliffe has grown up since the beginning of the Potter series, not that he minds. "I mean, it's gone incredibly quick — that's the thing — it hasn't dragged by or anything. It seems to have gone really fast," he said. "So, yeah, just so scary how young you can be, and, you know, just the joys of facial hair making me look older." The big coming-of-age moment in "Order of the Phoenix" is Harry's first kiss. Radcliffe has said before it took a lot of takes to shoot that scene. "The thing is, in an interview, I said it took 30 takes, which is what it did take," he said. "But on any scene from the various camera angles, you do about 30 takes. But it got misinterpreted as 'Daniel Radcliffe demanded 30 takes be done on the kiss scene.' "
When Smith joked that he might have been incapable, Radcliffe responded, "incapable of stopping maybe." Most people grow up out of the spotlight, but the world has watched the boy wizard turn into a movie star. Radcliffe says it's hard for him to compare his life to anybody else's because it's all he knows. "I don't think of myself as having grown up on screen or in front of the camera or whatever," he said. "So it's probably stranger for everybody looking in to see me grow up in this way than it is for me myself." And growing up means expanding his career beyond Harry Potter. Radcliffe got great notices for a starring role on the London stage, and he's got another film, "September Boys," coming out this fall. Harry Potter, he says, has given him an opportunity to flourish in ways he may not have otherwise. "All the other people I've talked to say things like, 'Wow, you must feel really constrained by Harry Potter.' But in actual fact, it's giving me amazing opportunities to branch out and do things I wouldn't have gotten to do had I not been involved in this series. No, 'Equus' was amazing to do, and I think I learned a great deal not just about stage acting but film work, concentration and focus." Radcliffe will be 18 soon. How is he planning to celebrate? "Not in any major way," he said. "I'm going to have a party obviously, I think, but it's not — you know, it's not going to be anything people will read about, hopefully."